27th April 1995—I was 11 years old when I visited the National Museum -- the repository of our cultural, natural and historical heritage. I remembered the majesty of climbing those steps and walking past the Neo-classical Roman columns until I was inside the Old Congress Building. Today, if the Metropolitan Museum’s identifying piece was the painting Virgenes Cristianas Expuestas Al Populacho by Felix Resurrecion Hidaldo and the GSIS Museum its Parisian Life by the painter Juan Luna, the National Museum’s, El Spoliarium, Luna’s most famous piece. Many people come to the museum just for this painting. But another less-popular but quite significant piece was the Manunggul jar. 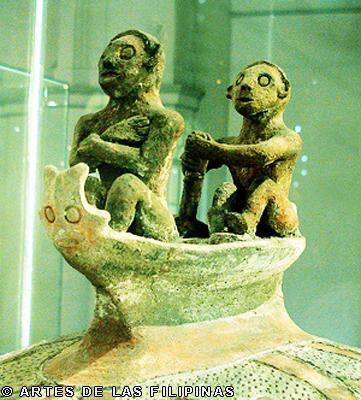 The burial jar with a cover featuring a ship-of-the-dead is perhaps unrivalled in Southeast Asia; the work of an artist and master potter. This vessel provides a clear example of a cultural link between the archaeological past and the ethnographic present. The boatman is steering rather than padding the "ship." The mast of the boat was not recovered. Both figures appear to be wearing a band tied over the crown of the head and under the jaw; a pattern still encountered in burial practices among the indigenous peoples in Southern Philippines. The manner in which the hands of the front figure are folded across the chest is also a widespread practice in the Islands when arranging the corpse. 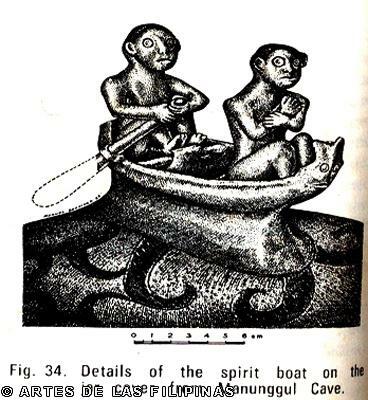 The carved prow and eye motif of the spirit boat is still found on the traditional watercraft of the Sulu Archipelago, Borneo and Malaysia. Similarities in the execution of the ears, eyes, nose, and mouth of the figures may be seen today in the woodcarving of Taiwan, the Philippines, and elsewhere in Southeast Asia. My familiarity with the Manunggul jar was spurred by the image in the PHP1,000 bill, circulated in 1995. Viewing the artifact up close fascinated me tremendously. I saw the artistry of the early Filipinos reflected in those fine lines and intricate designs. We were definitely not as dumb as the Spaniards told us we were! After a few years, when I took a cultural history subject during my undergraduate course in UP Diliman under Dr. Bernadette Lorenzo-Abrera, the Manunggul jar was given a whole new meaning. When an archaeological find was explained anthropologically, it was imbibed with far-reaching implications in re-writing its history. 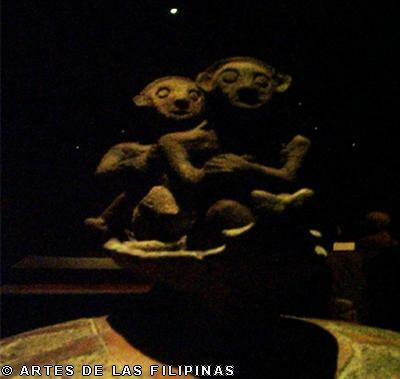 The Manunggul jar served as a proof of our common heritage with our Austronesian-speaking ancestors despite the diversity of cultures of the Philippine peoples. Traces of their culture and beliefs were seen in different parts of the country and from different Philippine ethno-linguistic groups. It was also a testament of the importance of the waters to our ancestors. The seas and the rivers were their conduit of trade, information and communication. According to Peter Bellwood, the Southeast Asians first developed a sophisticated maritime culture which made possible the spread of the Austronesian-speaking peoples to the Pacific Islands as far Madagascar in Africa and Easter Island near South America. Our ships—the balanghay, the paraw, the caracoa, and the like—were considered marvelous technological advances by our neighbors that they respected us and made us partners in trade. These neighbors later then, grew to include the imperial Chinese. Many epics around the Philippines would tell us of how souls go to the next life aboard boats, passing through the rivers and seas. The belief was very much connected with the Austronesia belief in the anito. Our ancestors believed that man is composed of the body, the life force called the ginhawa, and the kaluluwa (soul). The kaluluwa, after death, can return to earth to exist in nature and guide their descendants. This explained why the cover of the Manunggul jar featured three faces: the soul, the boat driver, and of the boat itself. For them, even things from nature have souls and lives of their own. That’s why our ancestors respected nature more than those who thought that it can be used for the ends of man. Seeing the Manunggul jar once more, I was also reminded of the inventiveness of the early Filipinos as well as the concepts and values they hold most-- their concept of the soul, for example, are believed to exist only on good-natured and merciful people. The belief was that the soul gave life, mind, and will to a person and if this was what our ancestors valued and exemplified, then our nation was not only great, but lived by compassionate people. However, the colonial masters in the past labeled our ancestors no good and even tried to erase our legacies and values, and despite the media today showing how shameful, miserable and poor our country is, from time to time there would be people who echo the same values that our ancestors lived by. With the new men that will spring from her bosom and the remembrance of the past, she will perhaps enter openly the wide road of progress and all will work jointly to strengthen the mother country at home as well as abroad with the same enthusiasm with which a young man returns to cultivate his father’s farmland so long devastated and abandons due to the negligence of those who had alienated it. And free once more, like the bird that leaves his cage, like the flower that returns to the open air, they will discover their good old qualities which they are losing little by little and again become lovers of peace, gay, lively, smiling, hospitable, and fearless. 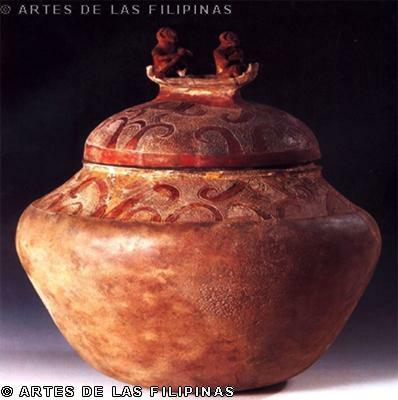 The Manunggul jar was a symbol of the National Museum’s important role in spearheading the preservation the cultural heritage—pamana—using multi-disciplinary techniques. It was a testament of how art can be a vessel of history and culture with the help of scholars. In this light, a simple jar became the embodiment of the history, experiences, and aspirations of the people and how the values of maka-Diyos, makatao at makabansa became part the value system of the Filipinos. I have visited the manunggul jar numerous times since that April of 1995 at the Kaban ng Lahi room of the National Museum II—The Museum of the Filipino People (former Department of Finance Building). Everytime, I look at it I am reminded of how great and compassionate the Filipinos are and how I could never be ashamed of being a Filipino. Everytime I look at the Manunggul jar, I see a vision that a new generation of Filipinos will once more take the ancient balanghay as a people and be horizon seekers once more. Abrera, Bernadette Lorenzo. "Ang Sandugo sa Katipunan," in Ferdinand C. Llanes, ed, Katipunan: Isang Pambansang Kilusan. Quezon City: Trinitas Publishing, Inc., 1994, p. 93-104. ADHIKA ng Pilipinas, Inc. Kasaysayang Bayan: Sampung Aralin sa Kasaysayang Pilipino. Manila: National Historical Institute, 2001. Bautista, Angel P. Tabon Cave Complex. Manila: National Museum, 2004. Bellwood, Peter. "Hypothesis for Austronesian Origins," Asian Perspectives, XXVI, 1984-85, pp. 107-117. __________. "The Batanes Archaeological Project, and the Current State of the ‘Out of Taiwan’ Debate with Respect to Neolithic and Austronesian Language Dispersal." Lecture delivered among the faculty of the UP Department of History, Palma Hall 109, UP Diliman, 28 March 2006. Covar, Prospero R. Kaalamang Bayang Dalumat ng Pagkataong Pilipino (Lekturang Propesoryal bilang tagapaghawak ng Kaalamang Bayang Pag-aaral sa taong 1992, Departamento ng Antropolohiya, Dalubhasaan ng Agham Panlipunan at Pilosopiya, Unibersidad ng Pilipinas. Binigkas sa Bulwagang Rizal, UP Diliman, Lungsod Quezon, Ika-3 ng Marso, 1993). EDSA 2000: Landas ng Pagbabago, a documentary of the People Power Commission, narrated by Vicky Morales and Teddy Benigno, directed by Maria Montelibano, broadcast date: February 2000 at NBN-4 and ABS-CBN 2. Fox, Robert B. The Tabon Caves: Archaeological Explorations and Excavations on Palawan Island, Philippines. Manila: National Museum, 1970. Maceda, Teresita Gimenez. "The Katipunan Discourse on Kaginhawahan: Vision and Configuration of a Just and Free Society," in Kasarinlan: A Philippine Quarterly of Third World Studies, 14, Num. 2, 1998, pp. 77-94. Quibuyen, Floro C. A Nation Aborted: Rizal, American Hegemony and Philippine Nationalism. Quezon City: Ateneo de Manila U. P., 1999, p. 215-216. "Rules and Regulations Implementing Republic Act No. 8491, series of 1998, The Code of the National Flag, Anthem, Motto, Coat-of-Arms and Other Heraldic Items and Devices of the Philippines" in The Flag and Heraldic Code of the Philippines illustrated (Manila: National Historical Institute, 2006). Salazar, Zeus A. "Ang Kamalayan at Kaluluwa: Isang Paglilinaw ng Ilang Konsepto sa Kinagisnang Sikolohiya" in Rogelia Pe-Pua, ed., Sikolohiyang Pilipino: Teorya, Metodo at Gamit. Quezon City: Surian ng Sikolohiyang Pilipino, 1982) pp. 83-92. Scott, William Henry. Filipinos in China Before 1500. Maynila: China Studies Program, De La Salle University, 1989. Solheim, Wilhelm II, G. "The Nusantao Hypothesis: The Origins and Spread of Austronesia Speakers," Asian Perspectives XXVI, 1984-85, pp. 77-78. Michael Charleston B. Chua is currently an instructor and a graduate student of the Department of History, University of the Philippines at Diliman, where he also finished his BA in History (2005). He is a member of the Bagong Kasaysayan (BAKAS), Inc, Philippine National Historical Society (PNHS) and the Asosasyon ng mga Dalubhasa, May Hilig at Interes sa Kasaysayan (ADHIKA) ng Pilipinas, Inc. Had lectured on different topics in different places and had been interviewed a number of times for local and national television.